This apple is a cross between Jonathon and Golden Delicious, and it combines the best of both! It is crisp, juicy with a sweet tart flavor. Just the right combination to appeal to those who like a sweet apple and those who like a tart apple! 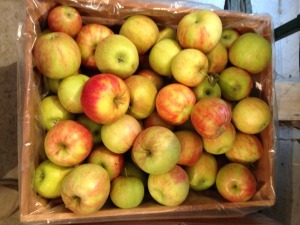 It is also a great multi-purpose apple as it works well to cook, for salads or caramel apples. We have plenty of them for sale both at the farm and at markets this week. We have enough of these to sell by the bushel or 1/2 bushel as well as 1/4 and 1/2 pecks. Send a message or call ahead for orders of 1/2 bushel or more. These are great apples to can or freeze also. The only downfall of them is that they do not store as well as some other apple varieties. JonaPrince and JonaStar are variations of JonaGold, having the same characteristics. JonaPrince tends to get a little more red coloring.